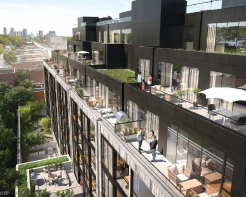 Eight Forty Condos is a boutique 9 storey building coming to vibrant St. Clair West. Designed by RAW Design, this intimate residence has suites from one bedroom to three bedrooms plus den and everything in between. 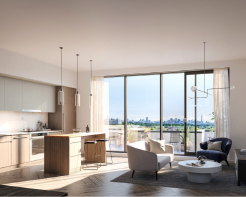 Suites at the condos are elegantly designed with single plank engineered flooring, euro-contemporary two-tone cabinetry, granite/quartz counters, ceramic tile backsplashes and large walk-in or walk through closets. All suites have outdoor space, including some suites with very large terraces. At Eight Forty Condos, you will find suites ranging in size from 575 to 1340 square feet. Layouts here are efficient and thoughtfully designed with nine foot ceilings and 10 foot penthouse ceilings. 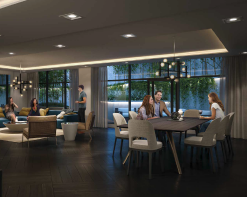 Amenities here include designer party room and adjacent patio lounge with BBQs, a fully equipped fitness centre, eco-friendly green roof, and bicycle parking. 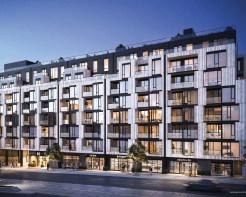 Located along St. Clair West, you’re steps to lots of new retail, amazing restaurants, and with a walk score of 94 you’re close to so many essentials like LCBO, grocery stores and a short stroll to the subway.